The Parkland has become a popular destination for snowmobilers. And it’s no wonder, with more than 3,300 km of developed trails set amidst gorgeous scenery. There are designated snowmobile routes through most towns, and an interconnected trail system exists from Rossburn, through Asessippi and Roblin to the Duck Mountains, and up to the Swan River Valley and Porcupine Provincial Forest. The Intermountain Snowmobile Club grooms trails from Inglis to Grandview and through to Gilbert Plains, then north to Ethelbert, and to Childs Lake and Wellman Lake in Duck Mountain Provincial Park. The trails interconnect with trails to Roblin and Dauphin. Snowtraxx Snowmobile Club Inc. grooms approx. 500 km of trails from where their trail system joins with the Roblin group’s trails, to where they connect with trails near Shoal Lake. 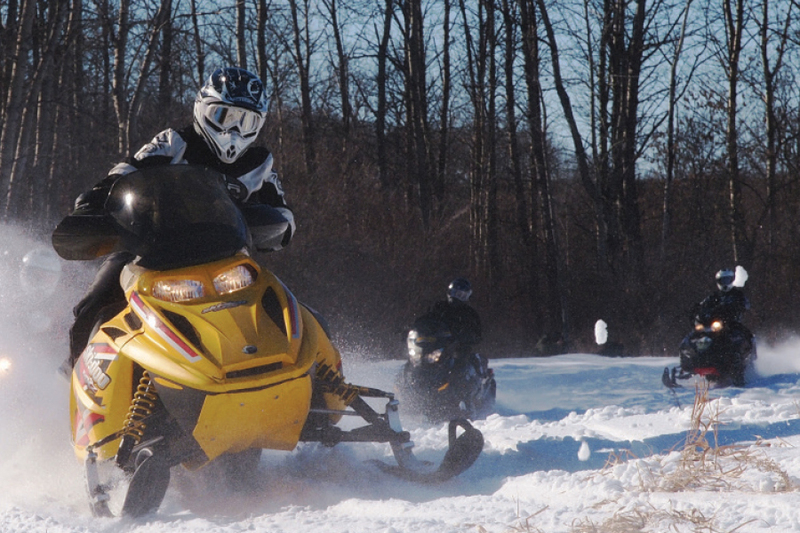 The Dauphin Snowmobile Club maintains trails near Dauphin. Other clubs include North Mountain Riders, Swan Valley Snowmobile Association, along with clubs in Dauphin, Ochre River and Roblin. Several sections of the Parkland portion of the Trans Canada Trail are open to snowmobile traffic during the winter months. Service stations and warming shelters are available throughout the area. Trail maps are available at Parkland service stations and hotels. For information on snowmobiling in Manitoba, visit the Snowmobilers of Manitoba (SNOMAN) website at snoman.mb.ca. Snowmobile Poker Derbies. A number of communities host snowmobile derbies. See the events calendar for derbies and other winter events.